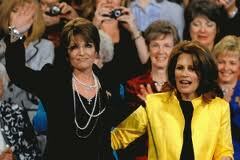 Now comes Sarah Palin, heading for New Hampshire for the Labor Day picnic, throwing shapes about running for president. The stable door is locked and all the candidates who matter are out in the field. You have left it too late. Michele Bachmann has stolen your best lines and is the resident Mad Hatter at the Tea Party. The fact is Sarah, your ego wlll not let you concede the field to Bachmann, a ' Jilly come lately' as far as you are concerned. You broke the ground for women in the Republican Party, you took all the slings and arrows as John McCain's running mate. Michelle is smarter than you Sarah, knows what she is talking about, even if much of it is way far to the right. She's pretty too which helps, and she is very good at controlling access so she gets lots of favorable press. Sarah, you sent too much time promoting yourself on cable and selling books. Now, the caravan has left town and Michelle is along for the ride. Showing up late in New Hampshire is the equivalent of arriving at the last picture show only to realize the last seat has been sold. Sure you will get coverage, but Michelle has her campaign up and running. You might as well go back to hunting grizzlies in the Far North.